Chinese olive cultivars are best known for eating fresh and used for processing. Fruits are oval with pointed to rounded ends and pits or internal stones. It may be green to red and golden yellow in color. The skins of fruit are thin to thick and crisp or tender. The fruit has astringent and tart to fruity and sweet flavor. Chinese olives are inherent to subtropical Asia and Africa. It is cultivated throughout greater China, Japan, Vietnam and Malaysia. It prefers warm summer, consistent rainfall and is sensitive cold and does not withstand sub-zero temperature. It could tolerate various growing conditions from poor soil to drought. The cultivar is naturalized outside Asia in Eastern and Northern United States where it revitalizes forested areas and attracts birds. Chinese olive is a subtropical and evergreen flowering or fruit bearing tree species belonging to genus Canarium in torchwood family Burseraceae. Chinese olive trees measures 7 to 25 meters tall. Branchlets are about 5 to 6 mm in diameter, tomentose with yellowish brown hairs when glabrescent and young. Leaflets are in 3 to 6 pairs; blades are elliptic, ovate, lanceolate, glabrous or abaxially measuring 6-14 x 2-5.5 cm. Inflorescences are axillary, glabrescent or minutely tomentose. Calyx is 2.5 to 3 mm, 3-fid in male flowers and nearly truncate in female flowers. Stamens are glabrous, filaments are related for more than ½ of length with terete or globose disk and slightly 6-lobed in male flowers. Flowers are then followed by 1 to 6 fruits about 1.5 to 15 cm. Drupe is yellow to green, ovoid or spindle shaped measuring 25 to 35 mm. Exocarp is thick and wrinkled when dry. 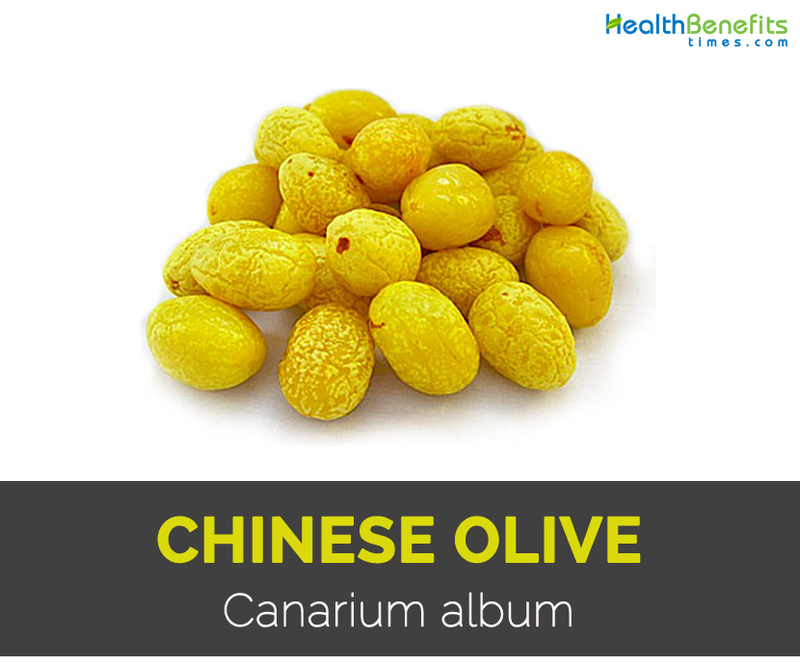 Chinese olive is regarded as a supplementary food to prevent diabetes and also its complications. Chinese olives have OE-MeOH-Ea which promotes mitochondrial function and activates AMPK to promote glucose uptake through regulating Ca2+ signaling pathway. Chinese olive extracts are antioxidants and anti-glycation agents towards copper induced and glucose induced LDL modification that must have potential to prevent diabetic complications. Chinese olive fruit is valuable to human health and is practiced herbal medicines but also by modern scientific research in Asia. Chinese olives have high content of dietary fiber which means nutrient in diet are not digested by gastrointestinal enzymes but has crucial role to ensure body health. Research shows that intake of 30 grams of dietary fiber assist to lose weight, improve body’s response to insulin and lower blood pressure. Fiber in low fat diet helps to slow absorption of fat and provides satiety for longer time period by eating dietary fiber rich food such as Chinese olives might aid to control weight better. Chinese olive possesses anti-tumor proliferative effect and functional compounds from extract include gallic acid, ellagic acid, methyl gallate, scopoletin and esculetin. Research shows that scopoletin exhibits anticancer activity by promoting apoptosis, cell cycle arrest and regulating expression of cyclin D1 levels in human prostate cancer cells. Diabetes is a chronic disease which happens when pancreas does not produce enough insulin and body cannot produce adequate insulin or when body could not use insulin effectively as it produces to use sugar. As the time passes, diabetes could harm various organs such as blood vessels, heart, nerves system and kidneys. Study shows that extract from Chinese olives promote mitochondrial function and activate AMPK to promote glucose uptake through regulating Ca2+ signaling pathway. Chinese olives helps to prevent diabetes in normal people and lowers of diabetics. Chinese olive kernels are applied externally to provide relief from lip pain and it could be used for treating chapped lips. Take ash of Chinese olive pits orally with rice soup for treating gastrointestinal bleeding. Mix the ash of Chinese olive pits with vegetable oil and apply it externally for treating chilblain which is a painful, swelling, itching and inflammation on skin typically on foot or hand caused by poor circulation in skin when exposed to extreme cold. Chinese olives stimulate appetite and exclude apprehension. In Chinese herbal history, it is used to ease gastrointestinal health. Fruit is useful to cure fever, relieve alcoholic poisoning and benefit throat. To treat painful swollen throat, intake fresh or salted fruit several times a day. To treat fever with thirst, take 3 to 5 pieces of fruit and cover it with water and then simmer for some time and drink it. Take five pieces of fruit and steam with fresh ginger, water and sugar. Take this three times a day to treat dysentery. Steam the pieces of fresh fruit, 100 grams of both lean pork and lotus roots with appropriate amount of salt. Take this once a day to help hemorrhoids bleeding and gastric bleeding. Take the Chinese olive fruit steamed with some water and sugar to cure chronic cough. Drink the liquid (prepared by simmering 5 to 10 pieces of fresh fruit, some water and 50 grams of sugar) as a cure for hangover. Apply the crushed Chinese olive fruit to infected sores and bleeding wounds. Roast the stones of fruit till they become charcoal and crush it into fine powder. Make the paste by adding some sesame oil. Apply this paste to the affected areas from chilblains. Chinese olive enhances salivation, stimulate appetite and purify lungs. It also acts as an antidote to intoxication by consuming alcohol or poisonous fish. Previous ArticleWhat is Cheerios and nutrition?